Since writing my last blog on meditation in the classroom I’m feeling reticent. You see, you mention the fact you meditate to people in a conversation and I find that people often change the subject or quickly brush it aside as a quirky little thing you do in private, and which should be kept that way. People seem uncomfortable with the concept of being still and looking inside themselves. The silence we might find in our own heads makes a lot of people very uncomfortable indeed. Perhaps it does me too; it’s not a tradition we have, is it? It’s not part of our lives in the western world at all. If you see someone somewhere just sat down alone without a phone, a book, tablet or earphones in people start to feel a bit uneasy about them. I mean, what are they ‘doing’? No really, what are they doing? Look at that bloke, he looks a bit weird. No, being quiet and doing nothing is odd. Contemplation and stillness is odd. Keep the meditations to secular, general topics – keep religion out of it. Keep the sessions no longer than 15 mins. Little and often is best. 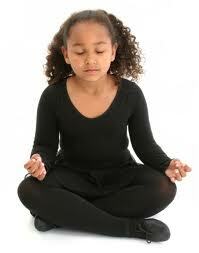 Start with a focus and concentration period to allow the children to calm down. Then introduce the analytical (thoughtful) part afterwards. (I’ll explain). My first point, restricting the meditation to secular topics, is because meditation is associated with the Eastern religions and people saying ‘OM’ a lot. You think meditation, you think of Buddhas floating around don’t you? But meditation is simply turning your attention introspectively towards your own mind which anyone can do, with or without a religion. It’s best to keep religion out of secular education (and that’s a whole other blog too). Now what are secular topics? Well, anything that is about lived, earthy experience I suppose, rather than anything spiritual. These would include topics that are pertinent to children in school like friendship, respecting others, learning from others, being patient, finding resilience, understanding change, being part of a team, these kinds of things. These are factors that affect children every day at school, and little tweaks in these areas would make a huge difference to their day at school…and ours. 10 minutes analysing one of the above topics, teacher taking it through with pauses. 2 minutes concluding, holding new feelings about the topic. “Sit comfortably, but with your back straight and close your eyes. Rest your hands in your lap comfortably in any way you choose. Now start to bring your attention away from outside, away from the noises of the school and bring your attention towards yourself. Breathe deeply for a few breaths, but not loudly enough for the person next to your hear your breathing (you have to say that otherwise they all start panting and you get a loud breathing competition). Now start to really become aware of your own breath. Feel the rise and fall of your chest as you breathe. Notice the air passing in and out of your nose over your mouth. Now try to make your mind follow your breath and not wander off into other thoughts. Focus on a breath in, and then a breath out. Don’t let any other thoughts come into your head. Hold your concentration on your breath. If your mind wanders bring it back to your breath. After a minute or two more – Now start to become aware of your body again, start to become aware of the classroom around you and then the noises outside. Roll your shoulders, move your toes, have a little stretch and open your eyes. Rest your eyes in the space in front of you. Take a very deep breath and blow out. Try this again. Have a little shake. Well done! Now for lots of people this might sound all very wishy -washy, but all I care about is effective methods to help children thrive in school, and evidence based methods too. This works. Do this properly and you’ll see an immediate effect. The children will be calmer and noticeably settled. The fidgety ones won’t be fidgeting for a long while too. They will walk to their desks calmly and the hub bub of the classroom will feel tangibly more focused and sharper. You will have given those children perhaps their first chance to focus themselves mentally and they will feel the immediate benefits of a relaxed, but focused mind. Your maths lesson will feel the benefits too! The first few sessions are about training. Some children will giggle and feel self-conscious at first, but once they feel safe and see that everyone is doing the same thing this will stop. Persevere with the ‘bravado boys’ who might take longer to get used to it. In my next blog I’ll go through some of the analytical meditations. These are effectively like PSHE sessions, but with kids working through it in their heads with you guiding them. In the meantime, just doing the five minute focus and concentration meditation will have an immediately positive impact on the classroom environment. Mind over matter – training the mind. Time for evidence and ownership.